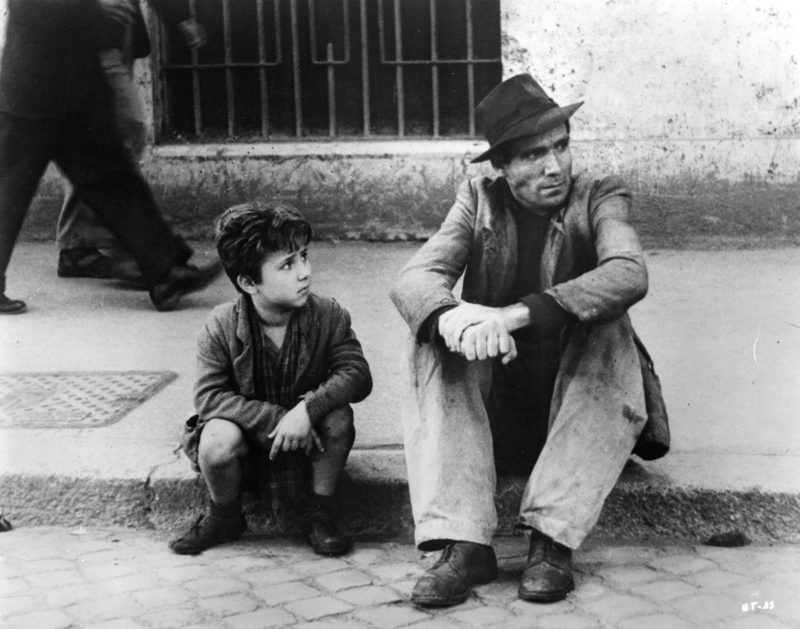 What are the thematic and ironic connections between the two actual bicycle thieves in “The Bicycle Thief”? The first bike thief stole the bicycle, because he could not afford to buy it, to sell and earn a living. Antonio, the second bicycle thief, did it because he needed the bike to earn a living, but could not afford to buy another one. 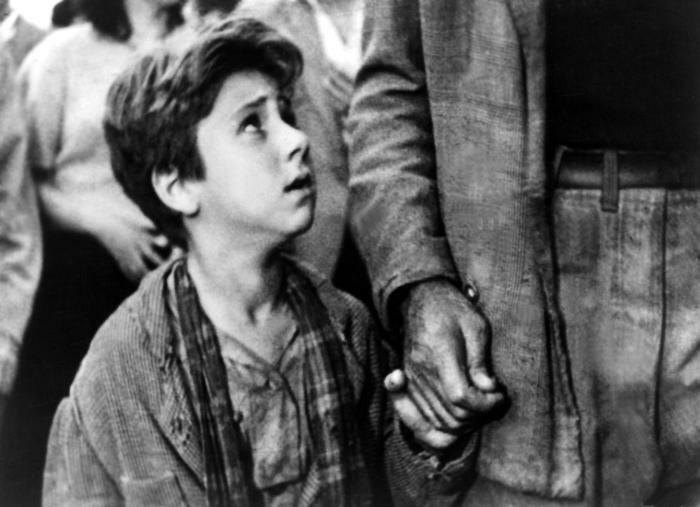 How does De Sica’s camera create the impression that the number of bicycle thieves could easily grow? Besides all the many shots of the unattended bikes at the stadium, which seemed to be unlocked and unchained, there were a ton of bike shops all over town where parts could be bought and sold on the market. There were also tons of bike stores which could essentially make a bicycle thiefs job a lot easier to unload the stolen bicycles to earn a living. What social ironies surround the acquisition, employment, and loss of Antonio’s bicycle? The bicycle gives Antonio Ricci the ability to earn a good living and live a better life, thus, increasing his social status. Without the bike, Antonio cannot earn a living and provide a substantially better lifestyle for his family. Antonios job depends on him keeping the bike at his disposal and in good working order. Once the bike has been lost, Antonio feels that he has to go out and steal a bike to compensate for his loss. What allegorical significance does the quest for its recovery acquire in the film? The quest for the recovery of the bike makes for the greater part of the story and the significance being Antonios desperation for and realization of a better life for him and his family. He exhibits the greatest desire to be a successful man and often becomes delusional in his attempts at the recovery of his bike. In his most desperate hour, he succumbs to his desires so badly, that he jeopardizes the safety of his son, Bruno Ricci. The closing statements of this film lead me to believe that Antonio never recovers his bicycle; therefore, never realizing the new life that he had desired so badly. In the final moments of the film, after Antonio Ricci has been caught stealing the bicycle, he is set free by the victim who is compelled by not wanting to bother with it because he believes that Antonio has suffered enough by the humiliation of being a bad example for his son. The surrounding crowds yell at Antonio with words to the effect, you got lucky this time! If it were my bicycle, I would have you locked up! How is Antonio’s son, Bruno, used as a barometer of the condition of Antonio’s spirit as he pursues his agonizing search for the lost bicycle? The one instance by the river where the little boy was drowning, Antonio has left Bruno behind as the crowds start to gather and shout The boy is drowning. Antonio slowly comes to the realization that perhaps its Bruno that has fallen into the river. Antonio soon discovers that Bruno is not the little boy in the river and notices that Bruno is standing at the top of the stairs removing his jacket then becomes seated. I found it odd that Antonio did not show an overwhelming relief that his son was ok. The second instance where Bruno was placed in harms way is when Antonio let Bruno fall behind while crossing the street at the intersection. Bruno almost gets hit twice by the passing cars which blow their horns, and still Antonio never looks back!!! WOW!!! I found this to be very disturbing that in Antonios most desperate hour he would allow his son to be put in harms way, not only once, but twice! Another unhappy moment in the film is when Bruno asks his father why he let the man go to the bathroom in the church, which ultimately led to his escape, only to be slapped by his father square on the face. 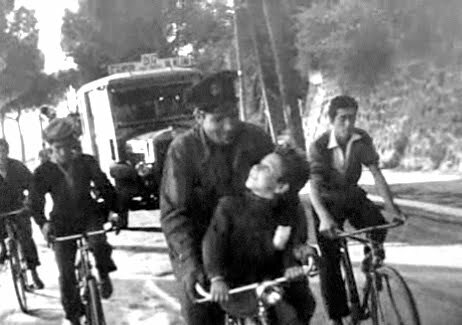 In a happier moment in the film, Antonio shows some concern for his son by turning his attention to Bruno, only after exhausting himself with the search for his bicycle, by asking Bruno if he would like some Pizza. Brunos face lights up with excitement seemingly letting go of the fact that he was unnecessarily slapped by his father shortly before. How in particular is he used in the film’s final sequence? After being humiliated by the unsuccessful attempt at the bike theft earlier, Antonio finally grabs Bruno by the hand as they walk down the street. Bruno is no longer left behind and becomes the focus of Antonios attention. I wonder what Antonio was thinking at these final moments in the film. Perhaps he was thinking about how he was going to explain the days events to his wife. Or perhaps he was thinking of other ways to get another bike. What images best capture the rich emotional relationship between father and son throughout the film? Bruno is by his fathers side most of the movie and he seems to be there as if to provide support in some way. Bruno often looks to his father, caring about how he feels and knowing his feelings. At the pinnacle of Antonios desperation, he allows Bruno to be put in harms way more than once by leaving Bruno unattended at times. Bruno endures many emotional attacks by his father before ultimately seeking independence from him after being slapped in the face for no wrong doing. Bruno then creates some space between him and his father by walking away.